IUFE thanks this team of Advocates for their success in court on December 19, 2014. Senior Advocate Bhagwan Das Bheel's statement brings a sense of united effort for all advocates and activists who have diligently participated in the sharing of this very important success. A special Thank you to everyone for making this girl's life happy again and also for the happiness of her family who have endured suffering as a result of her illegal abduction. Sending Congratulations to everyone. "Today Mavi Kolhi appeared before High court Hyderbad. on previous date that option had arise that she is minor and not to entitled to contract marriage as per law after that the Honorable high court sent her before Medical board for confirmation of her age. today in pursuance of previous order of Honorable High court , with regard to determination of age of the Mavi , superintendent Service Hospital has sent opinion of Medical Board with reflects that she is aged about 16/17 years. That in view of child marriage restraint Act,2013 she is not entitled to contract marriage as there is bar. after that court record her statement, where she stated that she want to go with her parents nothing else just four / five times she repeat this word that she want to go with her parents. its better to mention here that when she first time appear before court that time she was sent on remand to Dur ul aman (Shelter House). 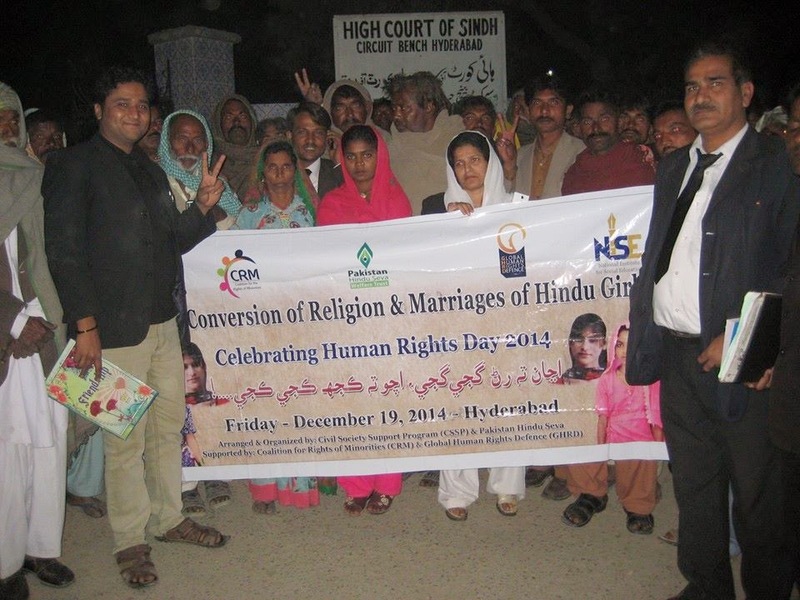 This Historical victory achieved with the restless struggles of Pakistan Hindu Seva Sandesh, Advocate HemanDas Kolhi, Advocate Veerji Kolhi, Advocate Hans Raj Kolhi, Advocate Bhoopat Kolhi Advocate Baghwandas BhagwanDas Bheel and civil Society Hyderabad. Thank you all of You to support us in this Nobel cause."